Home / News / DOG THIEF PLEADS GUILTY AND GETS A £200 FINE, £400 COSTS AND RECEIVED A DRUGS REHABILITATION ORDER AND MY DOGS ARE STILL MISSING! DOG THIEF PLEADS GUILTY AND GETS A £200 FINE, £400 COSTS AND RECEIVED A DRUGS REHABILITATION ORDER AND MY DOGS ARE STILL MISSING! The injustice in this case is staggering, why aren’t the authorities addressing these issues! 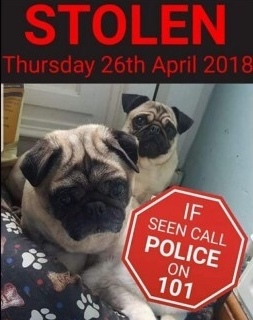 .The likelihood of this family getting their previous family dogs returned is not good when if ,like myself , you have found out about the appalling things that are happening in the UK at present to these innocent victims . The lack of strong enough legislation and inadequate sentencing regarding these toxic actions against our family pets is no deterrent and totally humiliating to this country and leaves the affected victims feeling heartbroken and totally despondent with no real support and justice being shown from authorities, the whole situation is intolerable and without sufficient understanding why this is being allowed to continue ! !